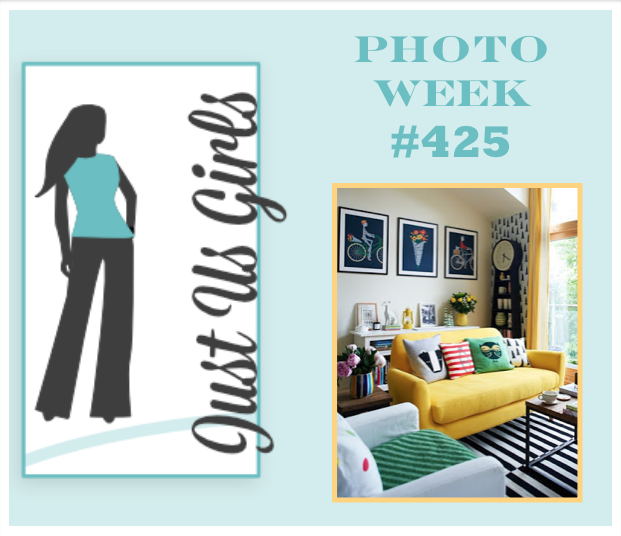 Hello friends, It’s time again for a new challenge over at Just Us Girls. It just so happens to be Photo Week and let me explain where my eyes were drawn to on this photo, as there is a lot to look at. I loved the bold white mats around each of the pictures on the wall, so I decided to put a white open frame on my card. I took the bold bright yellow couch as my color choice for my flower, next I noticed the pink florals in the vase next to the couch and picked out my DP and last but not least I decided to incorporate black on my card base from the black and white striped rug. Now that it is finished, I think the vellum leaves do a nice job expressing the light cascading though the window….okay…I might be stretching it a tad! LOL The butterfly, oval die and sentiment is SU, The Flower die is from SU- Rose Garden set, the vellum leaves are a huge die from Sizzix. I am also entering this card over at Addicted to Stamps and More where it’s Anything Goes! I hope you will drop by JUGS this week and check out the DT’s cards and our fabulous Guest Cathymac, and join us too. Nancy, this is a gorgeous card and I loved how you walked us through the process that inspired you. Love the white frame around the design paper and the yellow rose in the front corner. Sorry that you needed a sympathy card, but it will surely be received and given with a warm heart. Lovely card. I like your inspiration. Wow this card is stunning, I love the layer of vellum leaves! Thanks for joining us at Addicted to Stamps and More! I love how you took bits and pieces of the photo and combined them to make a beautiful sympathy card, Nancy. That was a great photo with so much inspiration to choose from. 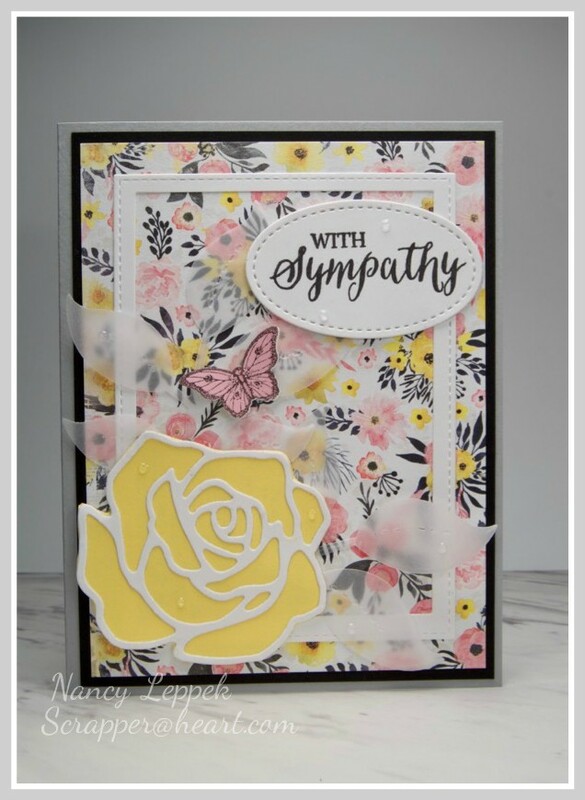 Gorgeous, everything goes together perfectly to make this amazing sympathy card – very soothing and pretty!!! This is stunning! Love all the elements you used. Where are the dies from? HI Maria, I updated my post to answer your question. If you are referring to the flower it’s SU. Beautiful sympathy card with lovely colors, images and background paper too! The colors are stunning on this one……so pretty. Love it! Your card is full of beautiful inspiration Nancy. You really picked so much from that gorgeous photo. Such softness with the lovely background, nice touch with the vellum and the sweet wee butterfly. Then you pop it up perfectly with that beautiful single yellow rose. WOW! This is amazing! You have such a great artistic eye, especially with this design! Love how you incorporated so many of the elements of the photo!